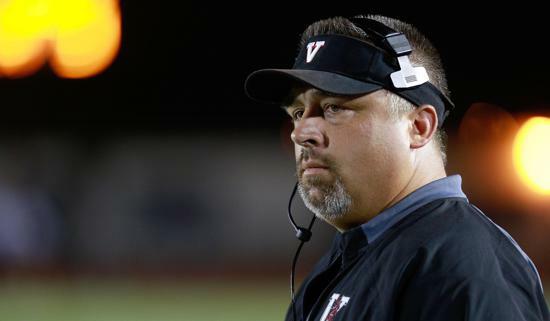 Friday's victory over rival Rancho Buena Vista was the first win at Vista for new Panthers coach Dave Bottom. VISTA — Vista High scored two touchdowns out of its new Wing-T offense late in the second quarter, a 12-yard run by Abraham Lopez and a 67-yard run by Desmond Taua, added two safeties, and went on to down rival Rancho Buena Vista 25-14 at Longhorn Stadium. The Panthers opened up a 23-7 halftime lead and gave new coach Dave Bottom his first victory since arriving from Alvarez High in Salinas in the offseason. RBV pulled to within 23-14 in the third quarter on Ace Roach’s 25-yard pass to Antonio Bowman. But Vista scored its second safety of the game when the Longhorns’ punter kicked the ball out of the back end of the end zone following problems with the snap. That made it 25-14. The Longhorns had cut a 9-0 Vista lead to to 9-7 early in the second quarter on a 66-yard scoring pass from Roach to Trent Borger, who caught the ball at midfield and raced the rest of the way to the end zone. Nicholas Stormo broke off runs of 24, 10 and 24 yards again to set up Lopez’s touchdown. Stormo had a 35-yard TD run called back near the beginning of the quarter. RBV’s Anthony Escalante recovered a fumble on the next play. The opposing defenses dominated the game early and Vista, getting dominant play from freshman Isaac Tinoasamoa, scored first on a safety on a grounding penalty in the end zone with 2:56 left in the opening quarter. The Panthers made it 9-0 after Elijah Davis carried for 15 yards to set up his own 26-yard touchdown run.